Bibliographic databases contain a huge amount of information on the dissemination of scientific knowledge and the relationships between papers, authors, and scientific work. Large-scale citation networks can be generated from these databases in order to provide a systems-level perspective on the processes at the root of the spreading of ideas, theories, and results in science. Citation networks are therefore one of the main proxies for our understanding of knowledge dynamics as well as invaluable systems for the quantitative analysis of the impact of specific scientific contributions, the emergence of technical and scientific areas, and the ranking of journals, institutions, and scientists. 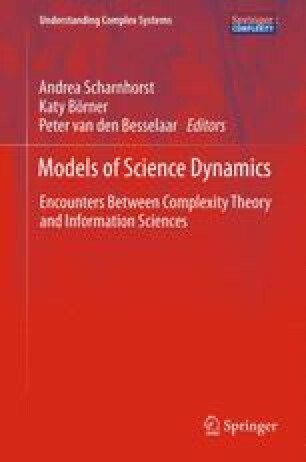 This chapter reviews recent developments made in the study of citation networks, ranging from empirical analyses of real systems and mathematical models of them, to the study of dynamic processes taking place in them and their potential applications. Furthermore, studying citation datasets with the tools of network theory opens new avenues towards a quantitative understanding of the dynamics of popularity with respect to papers, journals, and scientists, possibly leading to novel measures of impact and ranking. Bommarito II MJ, Katz DM, Zelner JL (2010a) On the stability of community detection algorithms on longitudinal citation data. Procedia Soc Behav Sci 4:26–37 (DOI: 10.1016/j.sbspro.2010.07.480), also available as arXiv preprint http://arxiv.org/abs/0908.0449arXiv:0908.0449. The article is part of: Hirschi C, Ingold K, Serdült U (guest eds) Applications of Social Network Analysis: 6th Conference on Applications of Social Network Analysis. Procedia Soc Behav Sci 4:1–102.